We are pleased and very proud to announce that we have won Best New Tax Practice at Tolley’s Taxation Awards 2017! We would like to thank all our clients and contacts for their support and without whom this would not have been possible. The category for Best New Tax Practice is for businesses that have been established in the last three years. Winning the award is testament to the hard work and dedication of our team, who have helped build this practice from scratch. When we started out in 2014, our vision was to provide tax advice for private individuals in a simple, no-nonsense way and this has been fulfilled. We now continue to grow and learn, in order to achieve our clients’ objectives in the most effective way. At the award ceremony on 18th May, we brushed shoulders with the likes of Deloitte and Menzies – winners in other categories. The awards evening, “the biggest night of the year for the tax sector in the UK”, took place at the London Hilton in Park Lane. Held in the Grand Ballroom, the event was compered by Hugh Dennis. A three-course dinner, after-show party with music by The Lionels and a casino made the evening a very enjoyable occasion. “the high quality and quantity of entries received each year indicates that our message is far reaching and that the awards are taken very seriously indeed. The prizes are now sought-after by UK tax professionals, whether they work for multinational companies or in accountancy and law firms”. 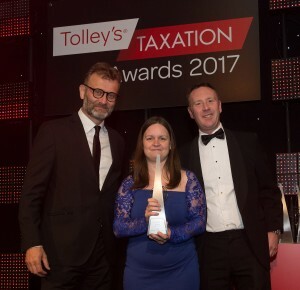 For more information about Tolley’s Taxation Awards, click here. For more information about Churchill Taxation’s range of tax services, click here.